Kiowa Creek Outfitters ? Premier Eastern Colorado Outfitter and Guide offering private ranch hunts for giant plains mule deer, whitetail and pronghorn. Kiowa Creek Outfitters is a premier Colorado Outfitter and Guide operating on the Eastern Plains mule deer, whitetail and pronghorn units. They hold the hunting rights to over 40,000 acres of private land that continually produce some of the biggest bucks Colorado has to offer. These ranches have been meticulously selected throughout units 104, 105, 106, and 132. 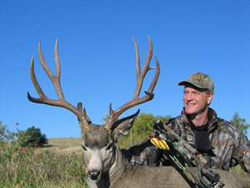 Trophy mule deer bucks are Dan?s specialty and his dedication and commitment to provide his clients with an opportunity at one of these eastern plains giants has earned him some national notoriety. Several cable television programs hunt with him each year as do the executives from some of the leading archery product manufacturers. In fact, Dan is a big archer himself and knows how difficult it can be and what it takes to be successful with archery equipment. 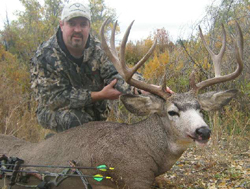 As a deer guide, Kiowa Creek Outfitters has developed and maintains an impressively high success rate on better than average eastern plains mule deer and whitetail bucks. Just a look at their photo gallery proves what the potential is of taking a true trophy buck with them. It hasn?t mattered which weapon choice is used either. Archers, riflemen and muzzleloaders have all taken some exceptional trophies with Kiowa Creek Outfitters. Not only does Kiowa Creek offer hunts for trophy deer, but their ranches also hold some very impressive pronghorn bucks and a few bull elk as well. As a pronghorn guide, they have been able to provide their clients with some true trophy pronghorn. Their leases are prime pronghorn habitat and by managing the numbers harvested the trophy potential remains very high year after year. Most of their elk hunting is rather limited and is usually done in combination with another species, but there are some great bulls living on their leases for those hunters wanting to go after them. Whether you are an archer, rifleman, or muzzleloader ? whether your objective is a trophy plains mule deer, whitetail, pronghorn or elk, Kiowa Creek Outfitters has the ranch to make your hunt an experience of a lifetime. Check out their website at Kiowa Creek Outfitters or contact HuntersTrailhead for more details.